6-2) Fill each square with a number to make the subtraction result correct. 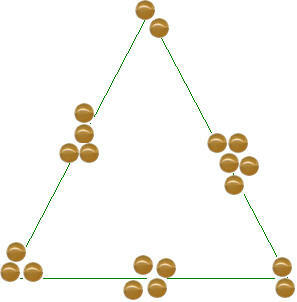 6-3) 6 piles of marbles are arranged in a triangle pattern. Each side of the triangle has a total of 9 marbles. Add 1 more marble to one of the piles, so that the total number of marbles on each side remains 9. You are allowed to move the marbles but not take any out. 6-4) Today is Friday. What day of the week is it 80 days from today?